My daughter is just in the very beginning stages of reading. She knows all her letter sounds and can identify a few sight words. This past month we started checking out early reader books from the library. Her favorite series so far is the Adventures of Otto Series by David Milgrim. These simple "Ready-to-Read" books are listed as Pre-Level 1 and are for kids that are just starting to learn to read. My daughter loves these books because the illustrations are humorous and enormously engaging, unlike some other books meant for beginning readers. 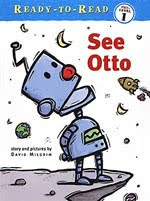 The main character, a cute little robot named Otto, goes on various silly adventures sure to generate some laughs. With simple words and sentences, lots of repetition and text written in a large font, this series is perfect for emergent readers. Best of all, the books appeal to both boys and girls. Some of the other "beginning readers" frustrated my daughter because they were too difficult for her reading level, but the books in this series are short and feature only a few words per page. Her favorite is Swing Otto Swing where Otto tries to swing on vines with his monkey friends, Flip and Flop. The books have boosted her confidence level, and I'm sure within a few months she'll be advancing to some of the more difficult early readers. If you have a beginning reader, I highly recommend this series. Sadly, it seems they are currently out-of-print, so you'll need to buy used or look for them at your local library. Inspired by Otto, we've been listening to some robotic music. My kids recently discovered the song "Mechanical Man" by Bent Bolt and the Nuts while listening to the kids' channel on Sirius Satellite Radio. The song is an oldie but it still is pretty darn amusing. Here's an interesting YouTube video featuring a guy pretending to be the Mechanical Man. Next time we read Otto, we'll have to try using our best robotic voices! I'm so glad you did this review. My daughter is just starting to read so I'm looking for basic books she can read. I think these are probably a little beyond her (she can read some BOB books, and that's about it at this point) but I'll put them on my list for a few months from now! These look like my son would love them! (Have you read the Mo Willems Cat the Cat series? Time to Sleep Sheep the Sheep, etc. They are so cute. That looks really cute. I'll have to keep an eye out for them. Oh, these are exactly what I have been looking for. Thanks.